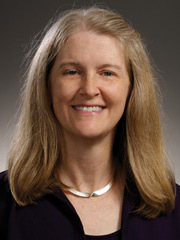 An expert in organometallic chemistry, Lisa McElwee-White has during the past five years established three active research programs that include both fundamental basic chemistry and applied collaborative work. Urea derivatives are important chemicals that can be used as biochemical markers, feed additives for poultry and swine, and in clinical treatments of some diseases, including AIDS. The most common approach to their production involves reaction of amines with phosgene or its derivatives, but this either requires a hazardous reagent or produces a problematic waste stream. To avoid these problems, McElwee-White’s research group developed a method for the catalytic oxidative carbonylation of amines to ureas using carbon monoxide as an alternative to phosgene. They are currently extending this method to hydantoins, urea ring structures found in anti-convulsant drugs. In collaboration with the College of Engineering, McElwee-White is developing new molecular precursors for the vapor deposition of inorganic thin films that are of interest to the semiconductor industry. They have been designing and synthesizing precursors for the chemical vapor deposition of tungsten nitride, a diffusion barrier candidate for next generation copper metallization schemes in semiconductor devices. An additional collaboration is exploring ternary materials as diffusion barrier candidates. One of the important challenges in fuel cell technology is the use of liquid fuels such as methanol and ethanol. Direct utilization of these fuels requires electrochemical catalysts, so McElwee-White and her group designed heterobimetallic single molecule catalysts for electrochemical oxidation of methanol. Due to widespread interest in renewable fuels, these studies are being extended to the oxidation of ethanol, which is available from agricultural feedstocks.